We had a fantastic time at the party - Ivonne, Garry's wife, made some amazing pozole, and we had a chance to meet all their wonderful neighbors. We even did ok for the Mexican trivia portion, thanks to some last-minute studying via wikipedia. The next day we set out to see Teotihuacan, an ancient city pre-dating the Aztecs at around 2,000 years old. It was a huge site containing both (what they believe to be) a Sun Temple and a Moon Temple. Despite being somewhat hungover from a little too much partying the night before we had a great time. It was pretty incredible to imagine what the city looked like back in it's heyday. Based on some of the paint that remained, all the structures were painted extensively, mostly in yellow and red. It must have been an amazing sight. On Sunday morning, we set out again, refreshed by our long break. 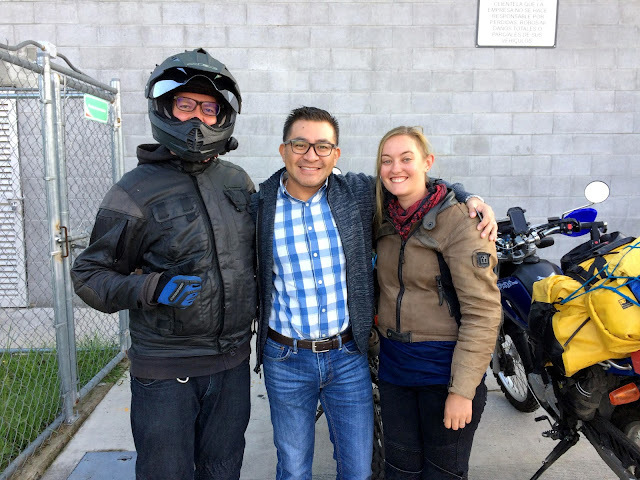 We stopped by Tres Marias for breakfast, an area legendary for all the motorcyclists who travel there at break-neck speeds every Sunday. We managed to not get run down by the speed-demons zipping by us and continued on our way to Puebla, where we planned on seeing Cholula, another temple. Tired after a day of riding, we stopped for the night just outside of Atlixco. At our first "no-tell motel" no less. From what we've heard, these types of motels are necessary in Mexican culture due to the fact that many people live with their parents until marriage (and even after), so "getting to know" your significant other can be rather difficult without these love hotels. It was surprisingly nice and affordable - we were able to park our bikes in a real garage underneath our room, and the room was nice and clean - all for 300 pesos for the night. They also had a steakhouse attached to the property which apparently employed chefs who had trained in New York City. Johanna couldn't pass up the opportunity to enjoy a New York steak for the price of 180 pesos (roughly $10). It did not disappoint. We had a great night, but woke up to a wake-up call at 6:53, letting us know that check-out was at 7 am - thanks for the 7 minute warning….grrr. We packed up everything in record time and headed out to find Cholula. On the way through Atlixco we had a car honk and the driver started waving enthusiastically at us, we assumed they had figured out that we were travelers from America, so we waved back as well. Shortly after we stopped at a local grocery to pick up some supplies and the same car pulled into the parking lot next to us. A local from Atlixco, Ruben, jumped out with his wife and introduced himself to us. Through our broken Spanish and his broken English, we described our planned trip and he expressed his enthusiasm and wish to do the same. As always, work gets in the way, haha. After that, we were back on the road to Puebla. We arrived shortly and set out to find Cholula - which proved harder than expected. After riding in circles for about half an hour due to the directions being completely off on our GPS program and missing signage in town, we decided to give up since there was no way it would be as amazing as Teotihuacan, and continued on to our next stop in Huajuapan. Johanna taking a power nap. We spent the night in yet another no-tell-motel and then continued to Oaxaca. On the way we passed through the small town of Nochixtlan, which didn't really catch our attention until we were mostly through town and ran into a few improvised road-blocks which consisted of burned out vehicles that blocked part or most of the road. Luckily, we ride motorcycles and we were able to maneuver around them easily. Later, we looked up the town and found out that they were put there during a conflict between teachers and the federal police a year before and that several people died. The vehicles remain as a grim reminder of that event. We rolled into Oaxaca city in the early afternoon and set about finding our hotel and something to eat for lunch. We popped into a little coffee shop and ordered a couple tortas which were on special for 40 pesos for both. While we waited for our food we noticed that there was a news report about an earthquake in Mexico City. At first we assumed that it was about the 8.1 earthquake that had hit the coast of Oaxaca/Chiapas a week earlier but then quickly realized that this was a new earthquake that originated just 75 miles outside of Mexico City, in the exact area we passed through just two days earlier when we traveled from Puebla to Huajuapan. This was a 7.1 size earthquake, and it occurred on the anniversary of the 1985 tremblor that killed 10,000 people in Mexico City. It was crazy to think that if we had stayed just a couple days more, we would have been effected by the quake. We contacted our host there, Garry, to see how his family fared and we also wrote to Ruben from Atlixco, which was also close to the quake. Luckily everyone was okay. The next day we set off to San Jose Del Pacifico, a town far up in the mountains at over 10,000 ft, famous for its mushrooms (magic and otherwise). We did not partake, and headed down to sea level the next morning to the seaside town of Puerto Angel, then continued east to Tehuantepec. Our totally not sketchy hostel. On the way we met a French couple traveling by 125cc motobikes from Guatemala. They were doing a short tour of Mexico before continuing on their boat trip. The following morning, we were loading up our bikes for another day of riding when suddenly the ground began to shake violently. It quickly dawned on us that we were experiencing an earthquake, which we found out later was a 6.1 and originated in Ixtepec, a town not too far away. We held on to our bikes to keep them from falling over and rode out the quake. Other people from inside our hotel began running outside and started calling friends and family to see how they were. Luckily the hotel did not seem to take any damage from the quake. We finished loading our bikes in record time and set out, hoping to mostly avoid aftershocks - which seemed to come at varying intervals of every five to twenty minutes. On our way we stopped in Juchitan to fill up on gas. As we pulled into the gas station we noticed that it was filled with federal police and that all the windows of the Oxxo convenience store had been blown out. One of the federal police came over to inquire what kind of bikes we were on and let us know that gas wouldn't be available, maybe until tomorrow. We asked if maybe it would be available a bit further away and he indicated that he didn't believe we'd find any that day. As another aftershock shook us and our bikes we decided to take our chances and made a plan to go 80 km to a town on our route where we knew that they had a gas station and a campsite. Worst case scenario, they wouldn't have gas available and we'd stay at the campsite and try again the next day. Luckily just out of town, after passing several buildings that had fallen down due to the quake, we found a gas station that seemed to be selling gas. We're not sure how legal that was however, since several gas stations afterwards were not, haha. We made it to the small town of Cintalapa in Chiapas state, stayed the night, and then headed through the mountains to San Cristobal de las Casas where we found a hotel for 150 pesos a night. We decided to stay an extra day. After San Cristobal we headed west to visit the ancient Mayan city of Tonina, which ruled from the 6th to 9th century and warred with Palenque, our next stop. It was pretty incredible, although since we were the only visitors there, we were constantly harassed by a local guide who wouldn't take no for an answer and followed us all over, so we left quicker than we intended. Afterwards we continued another 50 miles north to Palenque where we stayed at the Kin Balam Hostel. We dropped off our bags and walked 3 km to the ruins, sweating profusely all the way. We stopped at the very nice museum and learned a bit more about Mayan culture before trekking through the jungle to see the ancient city. Palenque lived up to the hype, and we felt grateful for the fact that there were very few tourists there - hoorah for low season! We got a bit rained on. Ancient ruin thirst satiated, we headed back to our hostel for some R&R and discovered a howler monkey just hanging out above the bathrooms. He did not seem to have any fear of humans and kept trying to enter the communal kitchen, despite being shooed away repeatedly. The next morning we woke up to howler monkey calls (we assume it's from the same monkey) and managed to catch an audio sample before setting out on the road again. We stopped for the night in Escarcega and then continued the next day to Calakmul, another ancient ruin deep in the jungle that may have also warred with Palenque and Tonina. Unfortunately, when we reached the entrance of the park, we realized that since there hadn't been a gas station since Escarcega (120 km away) we didn't have enough gas to make the 60 km to the ruins and back, so we had to continue another 50 km to get gas, fill up our bikes and our Rotopax gas can and come back. Love all the amazing ruins. Fascinating! I am enjoying reading about your adventures and your pictures. Keep posting away whenever you have a chance. It's great stuff.